Every year the VA holds a national art competition for veterans called the National Veterans Creative Arts Festival. I've entered the competition a couple times now, winning third place in my category ( veterans with physical disabilities) in 2009. This year I hope to enter the painting above. 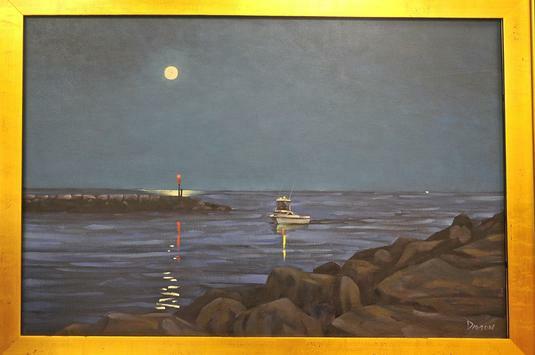 It depicts a small sport fishing vessel returning home from a long day's adventure. 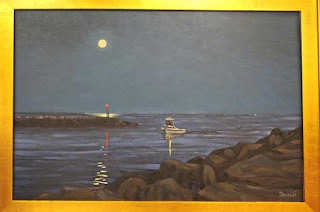 My wife and I took the picture I used for a reference photo from the same spot at Green Harbor (on the South Shore of Massachusetts) that I painted "Green Harbor Moon" (see post from 1/30/2012). The painting is not yet for sale. It will have to go through the accepting process and hopefully through several rounds of judging before I can accurately price it. This painting is a winner no matter how the competition turns out Peter! Good luck at the National Veterans Creative Arts Festival. We will be routing for you. Thanks Mike, I appreciate your continued support buddy. I saw your latest watercolor, looks awesome pal. We'll have to get together for some plein air painting this spring. You are so very welcome buddy! I love your work and it is a pleasure to see it posted on your blog. Plein air painting this spring is a great idea. I love the old barns in Middleboro or the cranberry bogs in Carver. Plymouth harbor has some great spots. So many great places to choose in south eastern Massachusetts! Keep on posting your great work for all to see.